okay, so let's talk comfort. you have no idea how amazing these Kustom shoes are....like no idea. here let me give you an idea! so you know when you go to mattress stores and walk around and feel how comfy all the tempurpedic mattresses are? yeah, okay so imagine that piece of heaven shrunk into little shoes...sounds amazing right! these little oxfords are so blissful, i think another thing that makes them so comfy is they are really light and airy (totally perfect for hot summer days) i was also given so ridiculously comfortable flip-flops which i will post about soon! but i wore these shoesies to school this week because i was gonna be doing lots of walking around campus. it was a brilliant idea because not only were they light and airy but they totally added to this california preppy outfit i decided to wear! oooh! i love those flats! that's so cool!! such a fun look! 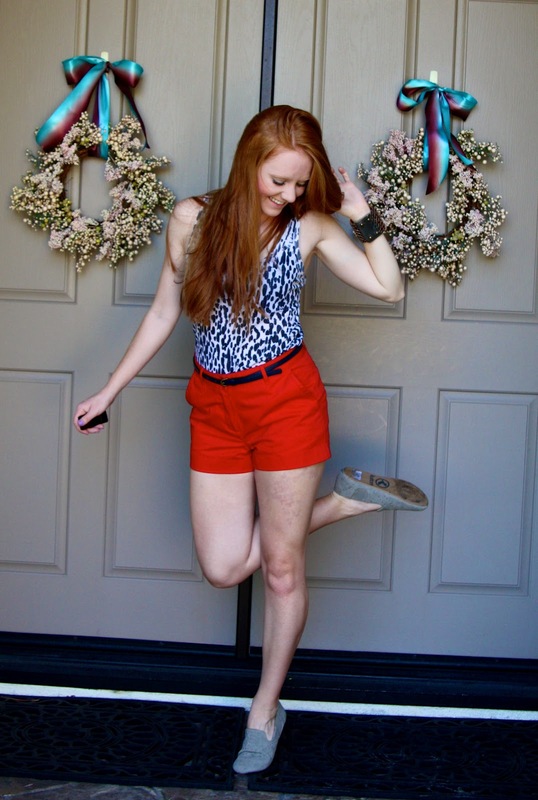 I love the print as a top mixed with the red shorts! and the shoes are so comfy cute! Also....thanks for the shout out on Twitter today...you are the SWEETEST!! I hope you're doing well! Comfy shoes can make your day so much better! Hope you had a great weekend!